Line Marking Tape is a heavy-duty PVC tape with a highly aggressive adhesive suitable for application on concrete and various floor surfaces. The tape is mainly used to mark out areas on streets, buildings or other hazardous places to keep people away from the site. The PVC-backed, 150-micron thick tape is suitable for use on various types of surfaces. Besides construction sites and accident-prone areas, the tape is also used indoors in the entertainment industry during shoots, in theatres for marking spots on stage, and various other purposes. The tape is useful for anyone who wants to mark an area or leave a cautionary message of a certain kind, without having to be present there for communicating to people. The Line Marking Tape is waterproof and oil-resistant; making it a highly functional tool which can be used in any type of situation. It also provides an easy means of marking areas as opposed to permanent painting jobs which take way more time, money and labour. The tape also offers the option of modification whenever you need to change the marking. The tape is available in several sizes and customers can also choose from custom widths. 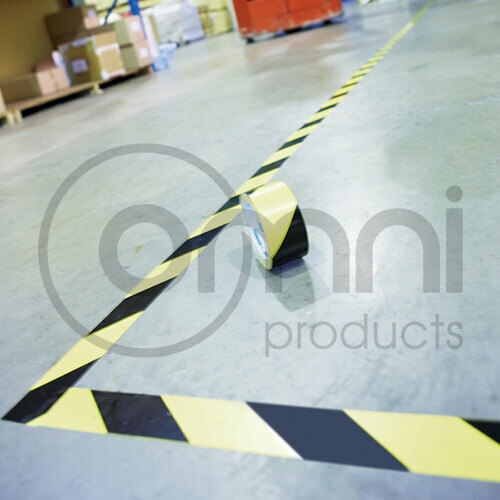 Omni’s Line Marking Tape is produced in yellow, red-and-yellow and black strips.